Moolt VR is application for smartphones that support VR glasses. It combines favorite activities of families with children: playing, cartoons watching, going into the cartoons atmosphere, communicating with animation characters as well as visiting cinema. 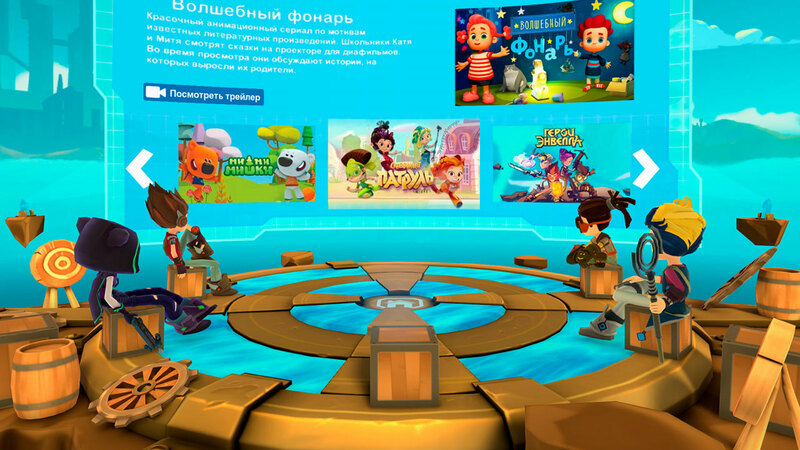 Before watching users can choose location from cartoon where the VR session will take place and animation characters that will accompany them at cinema. Some locations have been already created on the basis of animated series of its own production: Be-be-bears for the little ones and Fantasy Patrol and Heroes of Envell for an older audience. The app creators plan to agree with right holders on cartoons produced by other animation studios and to create new locations with favorite characters on their basis. 11 animated series are available on the first stage in Moolt VR: Leo and Tig, Be-be-bears, Fantasy Patrol, Woodventures, Heroes of Envell, Cutie Cubies, F.A.S.T., Paper Tales, Tima and Toma, Rolando Locomotov, Magic Lantern. Users will also be able to watch releases of new animation projects in the app. Some of the animated series, for example, Heroes of Envell, will be available in 3D stereo for the first time in Russia and in the world. 3D cartoons are created specially for the app. Most of Moolt VR possibilities haven’t been used in mobile VR apps before that’s why this application is unique. Moolt VR is released in three languages – Russian, English and Spanish. The app will be released in Russia simultaneously with other countries: the USA, Spain, UK, Australia, New Zealand, and Latin America countries. It will be possible to install Moolt VR app on Samsung smartphones that support Gear VR. One can also download it in Oculus store for the same name headset. Moolt VR – is the second app involving virtual reality technologies developed by Digital Television company and Parovoz Animation Studio. In February Interactive Moolt studio released Magic Lantern VR project – the game for VR devices based on the same name animated series. Russian VR game is available for every user of Steam – global game service that totals hundreds of millions of players all around the world.